Our mental limitations prevent us from accepting our mental limitations,” writes Robert Burton, M.D., in his thought-provoking book, On Being Certain: Believing You Are Right Even When You’re Not. He explains the power of “deep down conviction,” that “feeling of knowing” we have about cherished convictions that enables us to shake off seemingly any contradictory facts that threaten them. Does your stomach clench in a knot when reading or hearing viewpoints contrary to your own? That is a threat response. Your brain has invested a lot of time, if not effort, toward establishing sets of strong beliefs about many important things–religion of course, but also politics, relationships, your own special place in the world–and it wants to defend them. I have experienced this not just with religion but also in other aspects of life. One example is my urgent advocacy to family and friends several years ago of “peak oil” apocalypticism. On sites like The Oil Drum and Energy Bulletin (recently renamed), I read for hours about limited petroleum supplies, about the prospect of declining yields from the big oil fields of Mexico and Saudi Arabia. The facts seemed to fully support the sense of panic that was fostered by eloquent authors like James Howard Kunstler (The Long Emergency), and I wondered why people weren’t talking about it, doing something. Well, many of those facts still seem compelling, but we are still here, driving our cars, buying container loads of cheap plastic trinkets from China, with no dystopian nightmare in sight. New extraction technologies have boosted the yields of old fields and there are drilling rigs in places that were once thought unpromising. The number of barrels pumped per day is at an all-time high. The environmental travesties of oil sand mining and the BP oil spill have barely put a bubble in the relentless flow of crude. I look at all this and wonder, was I so wrong? Was I led along a path of alarmism by people who I thought knew what they were talking about? Or should I still cling to the belief, slightly adjusting aspects of it to maintain the general idea? The temptation is also there to restrict my reading to those who continue beating the drum for my erstwhile beliefs (and there is no shortage of such writers), but I have learned all too well that a painful truth is ultimately far more useful than a comforting falsehood. My answer for now is not to have a clear answer, and that is a difficult state for the human brain to maintain. It craves decisiveness, the neat packaging of convictions in a box, a satisfying end to the difficult work of questioning. The brain’s structure and the reinforcement it experiences over a lifetime makes us highly value the “feeling of knowing,” Burton says. Any search for objective truth must override our innate bias, and often causes us pain in the process–cognitive dissonance, hurt to our self image, sometimes even social rejection. Small wonder that we so often choose to shrug our shoulders and plod onward down the well-trodden path. Adapted from a Facebook posting on 11/30/​12. Update, August 30, 2015: The graph was generated from EIA Total Oil Supply data (link) from January 1994 to April 2015. 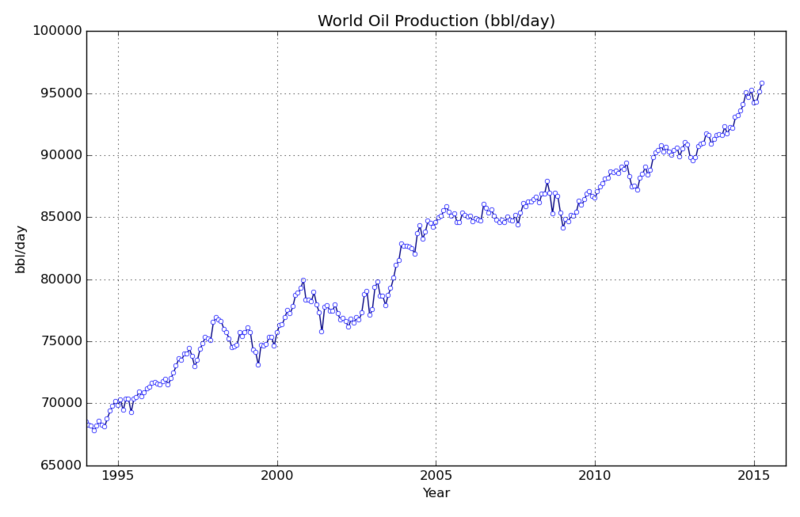 As the graph shows, world oil production has gone even higher in the nearly three years since I first posted this.